Now more than ever before, the work government employees do is very, very stressful. From understanding new legislation and requirements to thriving in tough management times, working in the government can take its toll on you. However, we do live in a digital age where so much of what we do is online. So why not use online services and mobile devices to actually improve our overall well-being? The key is to uncover the most useful websites, apps, and fitness trackers to actually transform our smartphones and mobile devices into vehicles of well-being. 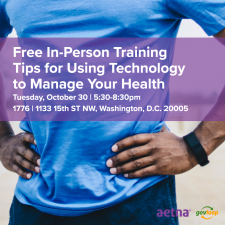 Join us on Tuesday, October 30 from 5:30-8:30 pm ET at 1776 (1133 15th St NW, Washington, DC 20005), as our experts provide insider tips for using technology to become healthier in these hectic times. Best practices for how these tools can help keep you motivated and on track with your wellness goals. Tips for tracking your exercise. Questions you should ask your healthcare provider.